Sometimes instead of going to the busy market to buy food, my co-workers and I would walk in the opposite direction to a nam tok street vendor. The smells of roasted rice powder and lime freshened up the polluted air around us as we stood and waited for our nam tok, which means waterfall in Thai. The nam tok vendor would scoop the grilled beef, green onion and cilantro mixture out of a silver pot, and slide it into a clear, plastic bag and twist a rubber band around it so it puffed out like a balloon. Then she would put the pure white sticky rice in a smaller clear plastic bag and fold the top over. All of it went into a white grocery bag, and she would gingerly place cabbage and mint on top. After picking up a creamy chayen, Thai iced milk tea, at the next vendor up, we would head back to school to eat before our next classes started. After getting white plastic bowls, forks and spoons from the kitchen area, we would dump our beautiful lunch into the bowls, sit down at small desks, and dig in. I loved grabbing the sticky rice with my fingers and feeling it adhere to them like Elmer’s glue. Then I would swirl the sticky rice ball in the nam tok juice, create a perfect bite of beef, cilantro stems and green onion, pop it in and savor. My mouth starts to tingle and long for my favorite nam tok street vendor to pop up in my kitchen right now, but Dom said he likes my nam tok recipe better than Thailand’s street vendors’ because we use skirt steak, and not fatty pork or beef like many street vendors use. The best part of nam tok is how the sticky rice complements the dish so well by soaking up the mouthwatering juice. If you don’t know how to make sticky rice, one method is to use splatter guards to make it, which you can learn all about here. I tried doing it this way, but my little boy got hold of my splatter guards and loved pressing his face against them, making me laugh and eventually busted the screens. I just bought some more today and will hide them in a secret spot. Another method I’ve tried is putting the Thai sweet rice in a large glass bowl in a pot of boiling water, covering it, and steaming it that way for about 20 minutes or so. You can of course can also buy a sticky rice maker at the Asian store or on Amazon, but we don’t have room for that, so I make do with what I got. Give this nam tok recipe a try, and let me know your thoughts! I’m here to help! Nam Tok is so full of flavor it seems hard to make, but it's so easy! 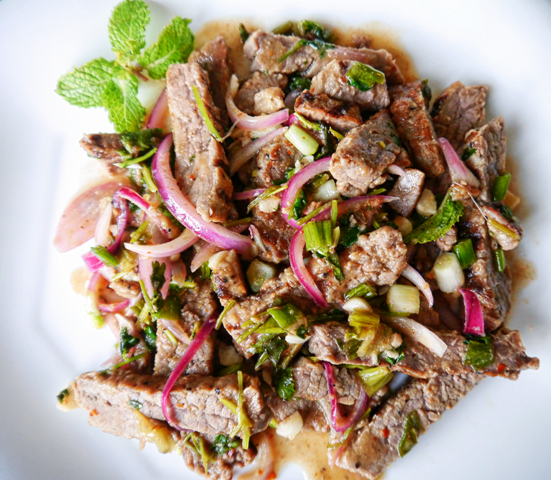 Try making this Thai Steak Salad today in your own kitchen! 1 c. green onion, sliced to 1/4 in. Soak rice over night, or for at least four hours. The less fresh your rice, the longer you have to soak it. If it's really old, just toss it and buy a new batch. Cook sticky rice using your preferred method while your meat is cooking. If it finishes cooking before your meat is done, make sure you keep it covered so it will stay sticky. Salt and pepper your meat. Grill the meat to your preferred doneness. Or if you are like me and have no grill, get a cast-iron pan steaming hot, and then put in the meat. If using steak, I cook each side for 2-3 minutes for medium-well, and I always set my timer, so I don't forget about flipping it. After it's cooked, let it sit for about 10 minutes. Then thinly slice it. Keep the juices from the meat in the pan, or on the plate. Turn the burner to medium, add the sliced meat back into the pan along with water, lime juice, fish sauce, toasted rice powder and chili powder. Mix and taste until preferred flavor. I like the lime in the lead, with the toasted rice powder, saltiness and chili following. Once the sauce has thickened a bit, turn off the heat and add the shallots. Mix until shallots have softened some. Then add in green onion, cilantro leaves and stems and mint. Eat with sticky rice, and use your fingers if you want to eat it super Thai redneck-style! I love Thai Steak Salad. I will give this version a try in my restaurant. Keep up the good work on this site. I really enjoy it. Awesome! Let us know what your customers think of the recipe Jack! Thanks for the encouragement! Wow. Just wow. I tried your Nam Tok recipe, remembering the various portions of Nam Tok I had while I was staying in Bangkok. Your recipe has a fair amount of herb and shallot / spring onion chopping in there but my goodness it was worth the effort. First test taste and it was pretty much as I remembered it. I added a thinly sliced lemongrass stalk and some finely chopped kaffir leaves as well. The other difficulty I had, was that I was making a kosher version. So – no pork but chicken legs instead. But also no fish sauce… so I used a mix of miso paste and light soy sauce – and a little sugar to help brown the skin on the chicken. But the taste of that Nam Tok herb mix brings back so many memories… definitely adding this recipe to my bookmarks, thank you. Tried your recipe tonight and it was seriously so perfect! Made my own toasted rice powder and everything! If you want to see a pic, you can look at my Instagram at: jessicaheywood. Thanks so much for a great recipe! So glad you enjoyed it Jessica! Looks awesome! I wish I could try your nam tok! Is there any chance you could say a bit about “toasted rice powder” and its uses in the Thai kitchen? Thanks so much!